Wintriss Controls Group will display ShopFloorConnect asset-utilization software, able to collect data from stamping presses, press brakes, laser-cutting machines, tube lasers, turret presses, machining centers, automated saws, welding machines, injection molders, paint lines and packaging machines. The software displays real-time machine-status information on a PC or mobile device—no need to install any special software. It automatically delivers reports showing downtime analysis and OEE, and provides the vital real-time data missing from many ERP and MES systems. ShopFloorConnect is a turnkey solution that is scalable and flexible, and quickly can be implemented into any discrete manufacturing environment. It comes factory-configured to communicate directly over your LAN with the ShopFloorConnect Machine Interface (SMI). The SMI installs on any machine, and using only two readily available control signals can track the machine’s operating status, production rate and part count (where applicable)—with no operator involvement. 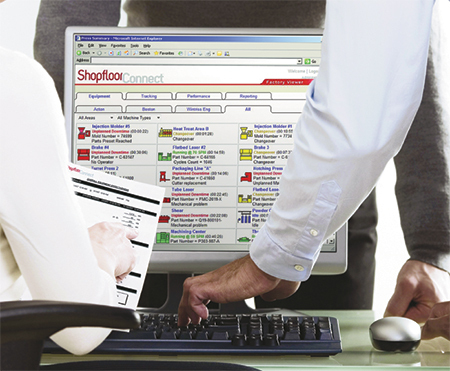 It features built-in Ethernet connectivity to communicate with the ShopFloorConnect server over an existing network.